Yes, thanks for this, Bob. And even more powerful perhaps in its evocation of the pastoral myth and its relation to both America’s and Canada’s “buried or uncreated ideal, the lost world of the lamb and the child,” is the passage from the Conclusion to the Literary History of Canada, where he speaks of Edward Hick’s great painting of The Peacable Kingdom [shown above]. 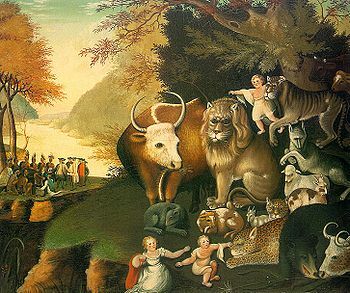 This entry was posted in America, Canada, Pastoral Myth on November 10, 2009 by Joseph Adamson.